I ran across this article by Elaina de Meyere in my Food Matters e-newsletter and thought it was worth sharing. - John Robbins, Diet For A New AmericaMaintaining one's health is also a focal point of the campaign. Myriad studies have linked diets rich in meat and dairy to ailments such as heart disease and obesity, and even certain types of cancers. By reducing our intake of meats, we lessen our chances of developing any of these devastating illnesses. 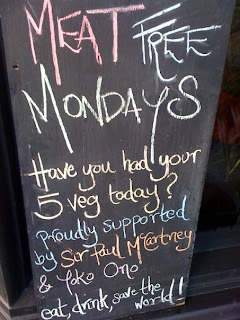 For more information visit Support Meat Free Mondays. I fully support this initiative! It's really not that difficult and the implications are huge.